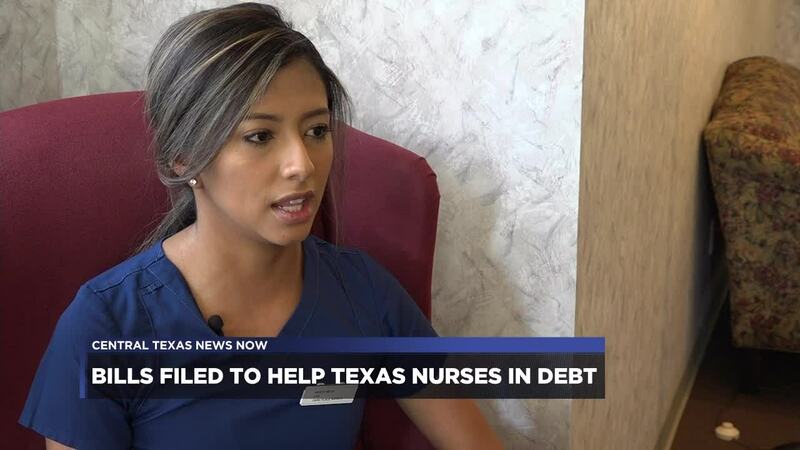 BELTON, TX — The debt many nursing students face after earning their degrees could soon be relieved. Two new companion bills making their way through House and Senate committees hope to create a student loan repayment assistance program for nurses working at long-term care facilities. Nurses like Helen Newhouse. As a licensed vocational nurse at Park Place Manor, Newhouse has dedicated her life to caring for the elderly community. "My mother is actually a nurse and I also help take care of my grandparents and so I kind of new it was the field for me," said Newhouse. Experts shared there is a growing need for nurses in the long-term care field. "Our population is getting older all the time. It's projected that by the year 2030 the adults in the state of Texas over the age of 85 will have doubled. So as our population ages, the need for those nursing services increases dramatically," said Katie Sanders, DNP, assistant professor and director for the Nursing Program at A&M Central Texas. However, Newhouse's journey to earning her degree and full-time job cost a pretty penny. "So that put me about $8,000 in debt because you kind of pay some of it up front," said Newhouse. She was not the only nurse who shared that they also had to pay the price. "I worked at LongHorn Steakhouse while going through nursing school. It was really tough having to like stay up and study, to go to school in the morning and then have to work in the afternoon," said Karen Mejia, who is also a licensed vocational nurse at Park Place Manor. "The cost of education [for nursing students] can vary depending upon the degree. A bachelors degree in the state of Texas can be approximately $10,000 per year. Master's education could be as much as $30,000," said Sanders. However, HB 3111 and SB 2300 were recently introduced to the House and Senate. The bills hope to create a student loan repayment assistance program for Texas nurses at long-term care facilities. "Older adults have more complex care needs and really require a higher level of educational preparation. And this provides an incentive for nurses to really focus on that area," said Sanders. Under the two companion bills, nurses would have to apply and qualify for the assistance. The bills states, to qualify, a nurse must be an advanced practice registered nurse, registered nurse or licensed vocational nurse and at the time of application for repayment assistance have been employed full-time by a convalescent, nursing or continuing care facility for at least one year. Newhouse and Mejia agreed a student loan repayment assistance program would go a long way. "People in general want to be nurses and it's tough going to school and having to pay for everything," said Newhouse. "There's a lot of good people out there that maybe can't afford to go to nursing school because it is a huge amount of money," said Mejia. The two companion bills were each introduced in March, and this week each bill was left pending in committee.